In the UK, greylag geese breed from the beginning of April to May, laying usually 5 – 8 eggs in a large nest amongst floating vegetation or hidden in reeds. The incubation period is about 28 days and, unlike many species of waterfowl, the male goose or gander stays with the family group. Geese, in fact, have a more cohesive family unit than ducks and both parents guard the goslings against attacks from other birds or predatory mammals. 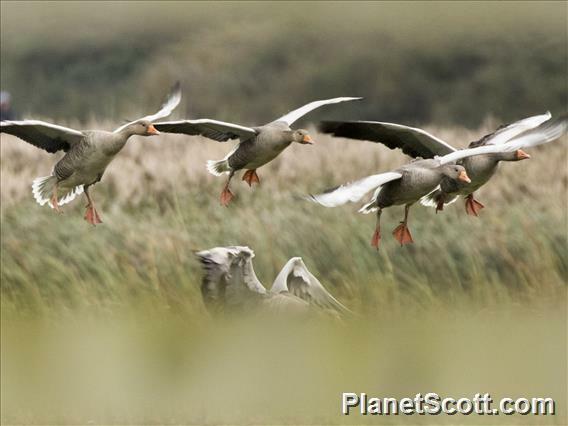 The greylag family continues to remain together throughout the year and will migrate from their wintering grounds as a group within a larger flock. Only when the adult birds are ready to establish a new breeding territory will the gander drive off the previous year's young birds. Geese are primarily grazing birds, although they also take grain, root crops and leafy vegetation. Geese have relatively short bills, and prefer pasture or meadows that are grazed by cattle or sheep. A flock of geese will work their away across the fields, nibbling the more nutritious growing shoots of the grass or cereal crop. Grass, by itself, is not particularly high in nutrients, and geese have to eat almost continuously in order to gain any nourishment from it. To allow these bulky birds to be able to take-off in an emergency, they process this grass at a remarkable rate. The birds defecate almost continuously whilst grazing so that their gut is not weighed down with food and they can still make a quick getaway if danger threatens.